If you can help distribute Boycott Israeli Dates leaflets in your community please contact the Islamic Human Rights Commission on 02089040222 specifying how many leaflets you would like. In 2004 the International Court of Justice ruled that the Israeli settlements are illegal – they are built on stolen Palestinian land. Growing dates is one of the major agricultural activities carried out by nearly half of the illegal Israeli settlements located in the Jordan Valley – it”s their most profitable crop, and contributes significantly to their economic viability. Picking of the dates is hard work, so the Israeli settlers bring in Palestinian labourers to do this back breaking work. During the pruning season the workers are dropped on the date palm trees by a hoisting crane at 5 o”clock in the morning, left perched on palms that soar to a height of 10 or even 12 meters – the height of a three- or four-story building, left there swaying in the wind for up to 8 hours without a break and with no means to come down until the crane returns at the end of the day, the workers cling to the tree with one arm and work with the other to meet their quota. They can”t even take a break to go to the toilet. If they complain or fall behind their quota they will lose their jobs and their families will starve. But the Israelis prefer to employ children – even issuing them official work permits, as they are quick and light, can climb trees faster, work for less and it”s easier to cheat and humiliate them. Out of desperate poverty Palestinian families are forced to take their children out of school and hand them over to the settlers to work for a pittance. Most of the Israeli date crop – up to 80%, is exported, mainly to Europe where it has around 10% market share. In 2005, dates were Israel”s leading fruit export. The two major Israeli companies involved are Agrexco and Hadiklaim. Agrexco, half owned by the Israeli government, handles 60-70% of all goods produced in the illegal Settlements. Its dates have brand names Carmel, Jordan Plains and Jordan Valley. Last September, a week before the start of Ramadan, Carmel boasted in their press release that they had managed an early crop of dates in order to meet the Ramadan demand for dates from Europe”s Muslims! Hadiklaim sells 65 percent of the all dates produced in Israel. Its dates have brand names King Solomon and Jordan River. They also supply Israeli dates to supermarkets and retail chains who market them under their own brand names. These include Marks & Spencer’s, Sainsbury’s, Tesco’s, and Waitrose. Sometimes they are labelled “produced in the West Bank” – this just confirms they are grown in the illegal Israeli settlements. Peace activists who visited the Palestinian village of Fasayl in the Jordan Valley last year discovered that villagers are slowly being forced off their land by the Israeli army. The only livelihood left open to them is to work for Carmel Agrexco. The activists even spoke to two Palestinian children under the age of 12 who were working for Carmel. The Palestinian workers whose land had been stolen and were forced to work for Carmel in order to feed their families – they had a message for the peace activists, a plea for anyone who would listen – they urged them to take action against Carmel Agrexco and such companies that support Israeli apartheid. What excuse is left for us not to boycott Israel? If you oppose the illegal settlements target their dates. Boycotting can make a real difference. Innovative Minds and the Islamic Human Rights Commission are calling on campaigners to create awareness in their communities about the boycott of Israeli goods, and in particular Israeli dates, this Ramadan. In order to educate our communities on this issue two videos and a leaflet has been produced. “Zaynab”s Story” explores the connection between an ordinary person living in Britain and what is happening in Palestine – how our actions as consumers in this country effects what happens to the Palestinians. It”s a heart wrenching video which exposes the brutality of the occupation as it touches the lives of ordinary people in Palestine. It then traces exactly how our buying habits help sustain this occupation, and ends by exploring ways in which we can start supporting the Palestinians. The boycott of Israeli dates forms its central theme. Its premier both in this country and overseas has been very well received. It duration is 36 minutes, and its available both as a DVD, or as a downloadable AVI for screening in a mosque, community centre or student society, and as streaming video on Youtube for personal viewing. “Boycott Israeli Dates” was specifically created for screening at venues with time restrictions which would not permit the screening of “Zaynab”s Story”. It duration is only 18 minutes, and concentrates solely on the boycott of Israeli dates. It is available both for downloading (hi-res AVI) or streaming (low-res Youtube). Please help us reach the widest possible audience by making copies of the videos, DVDs and passing them to your friends, placing them on your websites, etc. 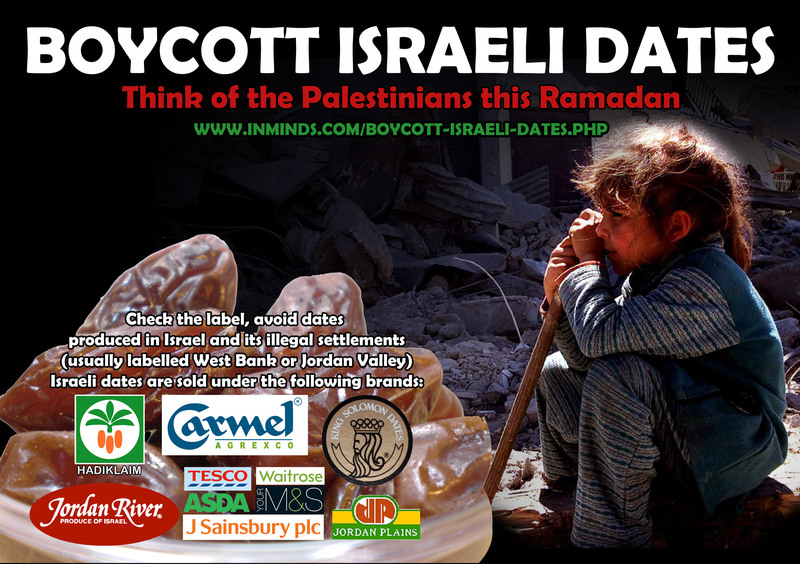 Boycott Israeli dates leaflets can be obtained by contacting the Islamic Human Rights Commission on 02089040222. Alternatively the original PDFs used for printing the leaflets are available for download should you wish to do your own printing ( rough guide to printing cost in the UK: 10,000 leaflets £125 inc delivery). We have also produced a sample letter to give to local grocery shops, greengrocers, etc. that serve the Muslim community. The letter politely asks the the shopkeeper not stock Israeli dates this Ramadan. Only one letter, with perhaps 3-6 people signing it, needs to be given to each shop (along with a leaflet which identifies the brands to avoid). For 60 years now they have lived under brutal Israeli occupation, their land stolen from them, their homes demolished and their children murdered in front of their eyes. The United Nations has condemned Israel on many, many occasions, and the International Court of Justice has ruled the Israeli settlements are illegal – built on stolen Palestinian land, and those that lived through the horror of apartheid in South Africa have described Israel as practising a much worse form of apartheid than thing they suffered under. And yet despite all this, the oppression continues, nothing changes. It is now left for us ordinary people to put pressure on Israel by boycotting its goods, by boycotting the fruits and vegetables it grows on land stolen from the Palestinians. It is in this endeavour that I humbly urge you, as your customer, please do not help oppress the Palestinians by selling Israeli goods, in particular please do not sell Israeli dates this Ramadan. Every year just before Ramadan, Israel especially targets small retailers who serve the Muslim community in to stocking its dates. 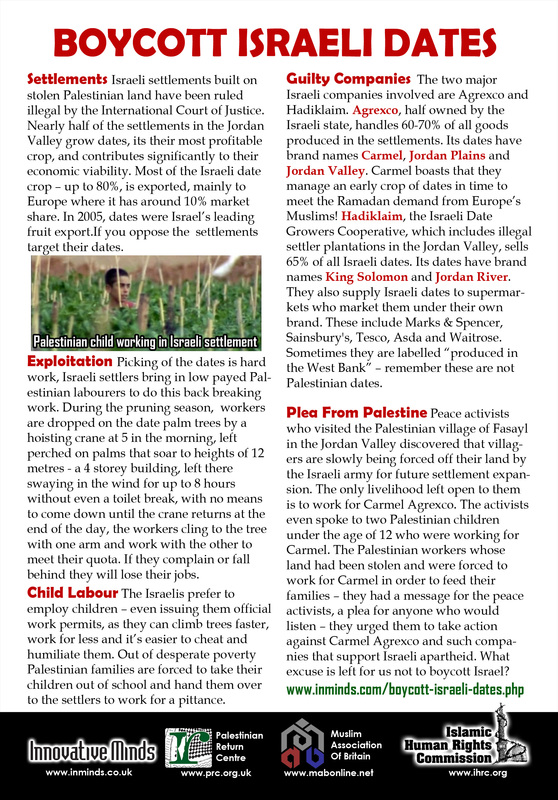 The included leaflet lists which brands of dates are Israeli and should be avoided, it also includes details of the suffering Palestinians undergo in the production of these dates. This Ramadan please think of the Palestinians. The idea is for activists to arrange a Boycott Israel awareness event in their community where they show one of the videos, give out the leaflets and ask people to sign the letters addressed to local shops serving the community (print out only one letter per shop which everyone signs like a petition). If you do initiate a Boycott Israeli Dates campaign in your community please do contact us via the feedback form (on the left column of this page) and share your experience with us. This Ramadan there is no excuse for any Muslim in the world to open their fast with an Israeli date.